M T D N o v e m b e r 2 0 1 8 58 D r . T i r e they just bring it in and say, 'I need a set of tires. Just put them on for me.' "A lot of times they don't even question us about price or what we're putting on because they know we're going to give them what needs to go on the vehicle and get the speed ratings right. ey know we're not going to take them to the cleaners, because we wouldn't have been here this long if we were doing that." Joe says it all boils down to superior service. In its mission statement, Dr. Tire promises "to deliver superior services to our customers and to improve the car care awareness of our community." "I think everything we do is superior, being that we have people who care about what they're doing. A lot of times in these bigger shops or big box stores they have workers who don't have the right amount of training. I can't tell you the number of cars that have come in here aer they've been to Walmart and had issues we had to take care of. I think it's because we've got the qualified people to do the job right the first time." 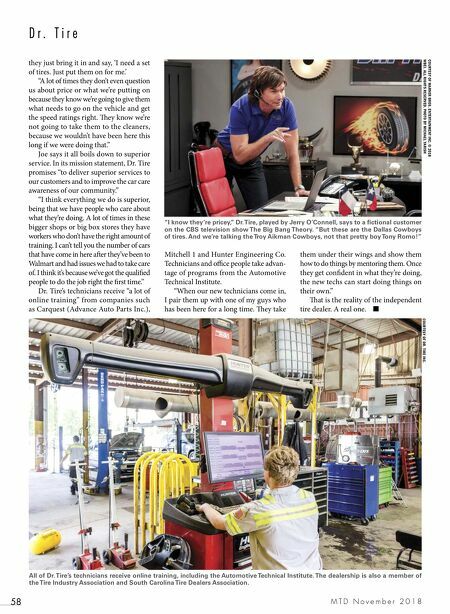 Dr. Tire's technicians receive "a lot of online training" from companies such as Carquest (Advance Auto Parts Inc.), Mitchell 1 and Hunter Engineering Co. Technicians and office people take advan- tage of programs from the Automotive Technical Institute. "When our new technicians come in, I pair them up with one of my guys who has been here for a long time. ey take them under their wings and show them how to do things by mentoring them. Once they get confident in what they're doing, the new techs can start doing things on their own." at is the reality of the independent tire dealer. A real one. ■ COURTESY OF WARNER BROS. ENTERTAINMENT INC. © 2018 WBEI. ALL RIGHTS RESERVED. PHOTO BY MICHAEL YARISH "I know they're pricey," Dr. Tire, played by Jerry O'Connell, says to a fictional customer on the CBS television show The Big Bang Theory. "But these are the Dallas Cowboys of tires. And we're talking the Troy Aikman Cowboys, not that pretty boy Tony Romo!" All of Dr. Tire's technicians receive online training, including the Automotive Technical Institute. 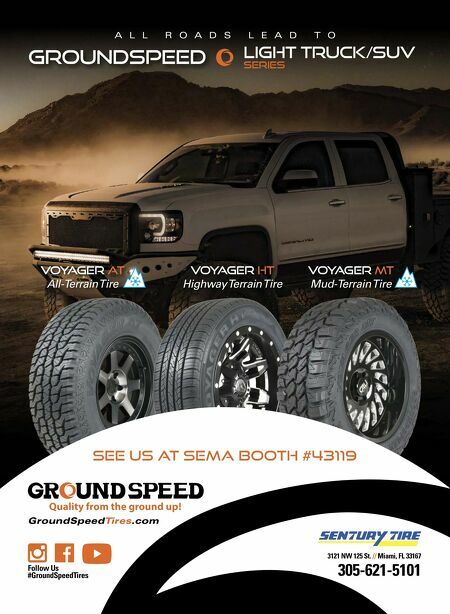 The dealership is also a member of the Tire Industry Association and South Carolina Tire Dealers Association. COURTESY OF DR. TIRE INC.